I often try and plan my weekly menu so that I can shop for everything at once, there are dishes that we often have on repeat each week. 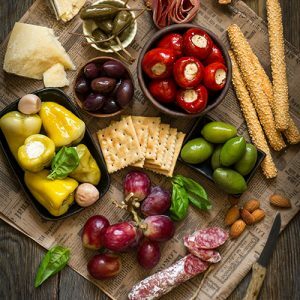 I love platter food and one of my favourite dishes is an antipasto platter, or as my lovely German friend calls it, Brotzeit, the literal translation is bread time, although I think it’s the nibbles that you put on the bread that make all the difference. This is a Friday night favourite, washed down with a nice glass of kombucha, (or wine). The following list of platter food, can all be found at Fresh Choice Nelson. Ceres organics brown rice, green tea and seaweed crackers topped with their amazing energy spread (ground almonds, pumpkin and sunflower seeds) and a dollop of sauerkraut. Cannon hill hummus with carrot, cucumber and red pepper sticks. Dovedale turmeric bread (gluten free), fresh out of the packet. Whizz up some dukka by toasting 1/2 C almonds, 1/2 C hazelnuts, 1 tbsp of coriander and cumin seeds. Blend until coarse before adding salt to taste. Tip Pablo corn tacos brushed with a little olive oil and crushed garlic, toasted in the oven until crispy and broken up into chips. Bean Supreme beetroot patties, (or any of the awesome new foods in the chilled veggie/vegan section), baked in the oven and cut into chunks. Edamame beans, steamed and sprinkled with sea salt. Fresh made guacamole using new season avocados. Mash two ripe avos with the juice of 1 lime, 1 clove of crushed garlic, 2 tbsp of minced red onion, 1 small tomato cut into small chunks, 1 tbsp of finely chopped coriander and salt and pepper to taste. F. Whitlock’s caramelised onion chutney. Add any of your favourite platter food nibbles, invite some friends around (ask them to bring their own favourites) and enjoy the feast!